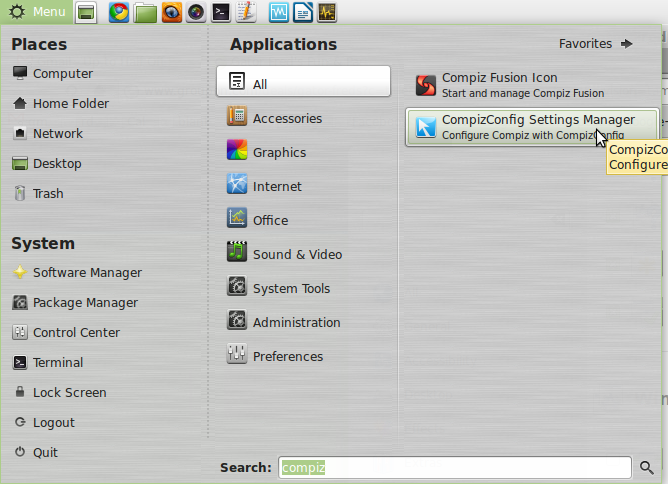 3) Inside the “Put” submenu you’ll see several options. 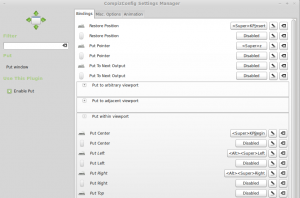 The one you want to move windows between monitors is “Put within viewport,” which is the fourth from the top. Select the + sign next to it to see the options. While you can “Put” your windows in lots of locations, I primarily just use two: “Put Left” and “Put Right”. 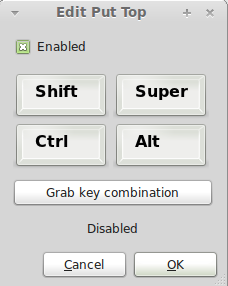 6) Click on “Grab key combination” and another window will pop up that will detect the keyboard combination shortcut you want to use to put your windows across monitors. I use “Alt+Super+left” for moving windows to my left monitor and “Alt+Super+right” to move windows to my right monitor (as shown in the image above). Once you enter your keyboard combination, hit “OK” in the prompt, set up any others you want to use, and then click on “Back”. 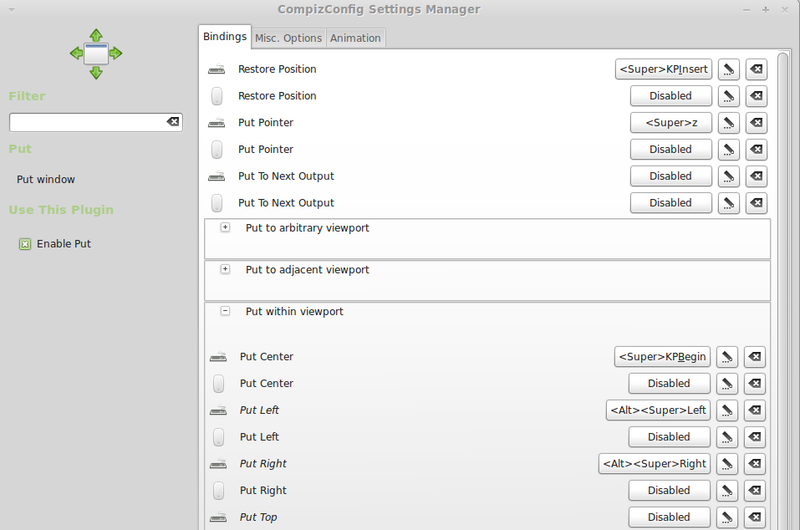 Make sure you’ve selected the checkbox next to “Put” then close CompizConfig Settings Manager. 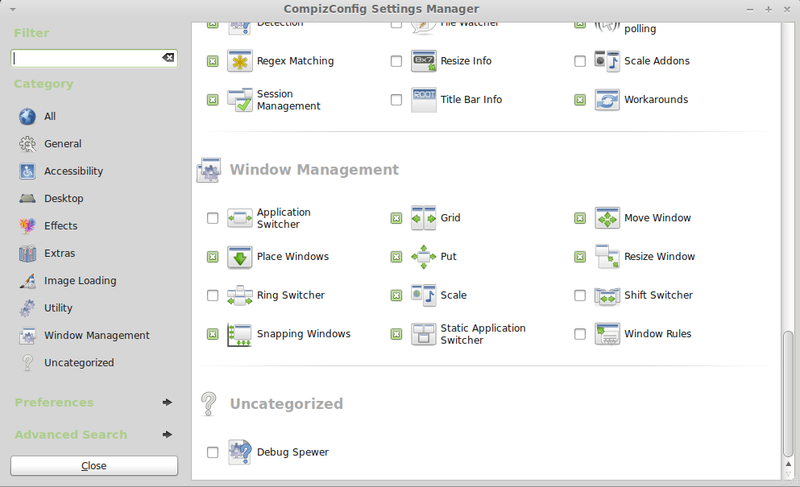 Note: Another very useful keyboard combination utility that comes built in with CompizConfig Settings Manager is the “Grid” utility which allows you to move a window to different areas of your monitors as well. 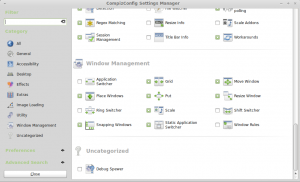 This utility is located in the same area as the “Put” utility. It is activated by default. The keyboard combinations are “Ctrl+Alt+keypad numbers”. So, for instance, to move a window to the center of a monitor, hit “Ctrl+Alt+KP5,” which is the center key in your keypad. To move it to the right, use KP6, etc. Grid has several levels of alignment built in, which you can see by hitting the combination repeatedly until you get the window to the size you want, as shown in the video below. 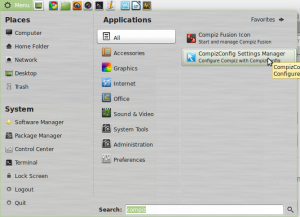 In Linux Mint 19 MATE, I had to go to Menu > Preferences > Desktop Settings, and change Window Manager to Compiz (from default Marco+Compositing). The Grid and Put feature started to work properly.